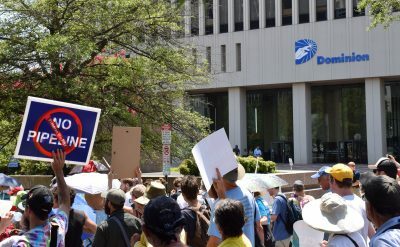 Citizens against the proposed fracked-gas Atlantic Coast Pipeline protest outside Dominion Energy headquarters in Richmond in 2013. A proposal from Dominion Energy introduced today in the Virginia General Assembly would give the company — which profits from a state-sanctioned monopoly in its service territory — new latitude to further its interests at the public’s expense. Among other things, it continues a long-standing history of Dominion stripping authority from the State Corporation Commission through carefully crafted, complex legislation in order to boost profits. The package introduced today proposes a new system of accounting that would ensure Dominion maintains lucrative profits in the long-term under the guise of short-term benefit to ratepayers. “This bill is bad policy and dangerous, giving Dominion even more power over our lives and our future. For far too long, the legislature has gone along with the monopoly’s plans, and it’s high time for our elected representatives to finally say ‘no’ to Dominion. “It’s not lost on anyone that this is the same goliath corporation that wants to use eminent domain to condemn ordinary Virginians’ farms and woodlands to build the unnecessary, expensive, and destructive Atlantic Coast Pipeline. “Our rates have been held artificially high for more than a decade. The relief promised to Dominion customers today is in large part a response to the new federal tax law, but Dominion is using that as a headline to distract our attention from its long-term strategy to boost its profits at our expense.